It’s 1848 and thirteen-year-old Jacob Whitmore hurries to Santa Fe, New Mexico, to seek a long-lost relative rumored to be dead. When he finds Uncle Whit and learns the angry, bitter man is preparing to head over the Old Spanish Trail to California, Jacob joins the caravan, hoping he can convince his uncle to return home to a sister who desperately needs him. On the journey, Jacob has little patience with Whit’s wild ways, until he learns to recognize his own failings and tries to understand the troubled man rather than condemn him. Yet Jacob’s various missteps, along with the discoveries that Whit has a secret side-business and an enemy who holds unknown power over him, threaten to destroy his mission, which in turn could jeopardize his own plan to stay on the frontier. Ages 10 and up. 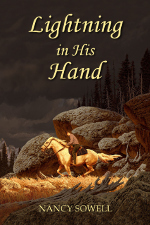 Lightning in His Hand is available as a paperback and as an ebook in both epub (Apple, Nook and others) and mobi (Kindle) formats. It may be purchased through your local bookstore and is also available online at retailers such as Amazon, Barnes and Noble, and Smashwords. A sequel is in the works which will follow Jacob’s travels into gold country—along with most of his compatriots in the first book—during the California Gold Rush.